I realized something today. I don’t know if all hikers feel this way. Sometimes the walking is boring. There I said it. Am I a terrible hiker? Sometimes I just want to sit and look and enjoy a view. It’s Saturday so lots of dayhikers. I saw a bunch of eager Boy Scouts. Crowds of older Asian hikers. I think Chinese? A couple ladies stopped me to ask about my hike and gasp over how far I’d walked. I ran into a trio of AmeriCorps volunteers working on the trail. Those brown uniforms they wear are cute, or maybe it was their rosy outdoor youth. I traded smiles with a girl wearing a cap that said Make America Gay Again.. Close to one rest stop, a herd of trail runners galloped by me. Nice legs on all of them. Trail running must a good sport for leg muscles. Great people watching overall. These hills over L.A. sure do get a lot of visitors. This hiker box injury on the tip of my right index finger is not healing. It’s the worst place to have a cut. I stick my finger in things all the time and it stings each time. This is going to be like my thumb cut in Colorado that never healed. I ran into more poodle bush. So much poodle! Some dead and withered. They must spray poison on it. Is it worse than poison oak, cuz there’s plenty of that too. It really does smell like pot. The leaves are similar too. I wonder if the plants are related? I walked after dark as usual. There was a layer of fog coming into the valleys around sunset. Pretty, and also, spooky. Oh man, those last couple miles with headlamp, the mist was swirling. I started hearing voices in the mist. Whooo! I got to the fire station and realized they had a big speaker on the building. It’s a serious fire station. Back when I rode my bike across the country I once camped at a volunteer fire station in Iowa. The volunteers were sitting around drinking lite beer waiting for the occasional call. I bet these firefighters don’t do that. I was pretty much blind in the mist when I stumbled down the hill in darkness. Thank you to those descriptive comments in Guthooks otherwise I’d have had no idea where to camp. I found the picnic area and it was so windy, I had to stake my tent out before hooking in the pole. Gretchen I’m really enjoying your frequent updates, especially as I’m stuck in an office. 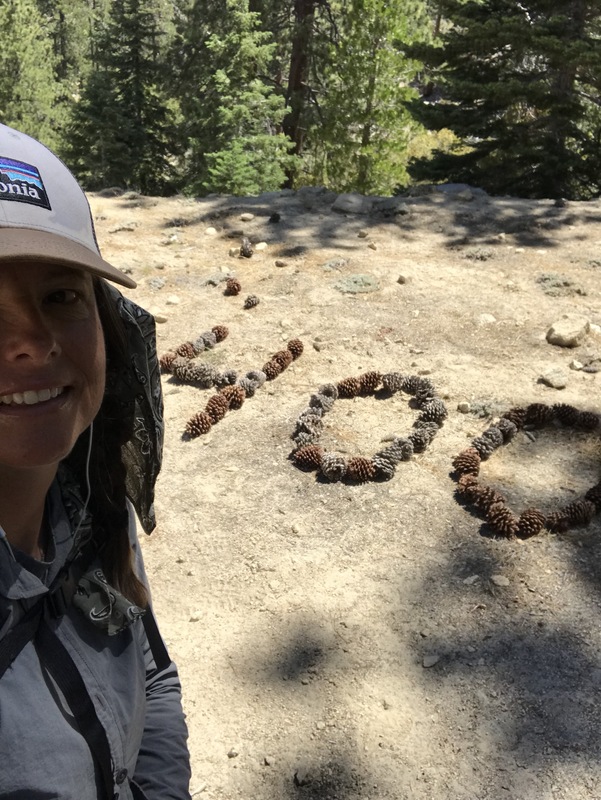 Your doing great, and seem to be moving towards that ‘big or bigger mileage’, The Holy Grail of PCT hiking. But whatever, have a great time and keep posting. Best wishes. Grant.